Several American presidents have had quarrels with their generals, sometimes for reluctance to take the fight to the enemy, occasionally for wanting to take too much fight to the foe. Generals have to be careful in these quarrels. Abraham Lincoln despaired of the sloth and timidity of George B. McClellan, a dandy in medals and ribbons who was a punching bag for Robert E. Lee and was forever begging for more men. "Sending more men to McClellan," Lincoln said, "is like shoveling flies across a barn." Douglas MacArthur, a genius at squeezing success from meager resources in trying to save the Phillippines, begged President Franklin D. Roosevelt to distraction with pleas to get some of the troops FDR was sending to Europe. A decade later MacArthur later pushed President Harry S Truman an impertinence too far, demanding to be allowed to bomb Chinese concentrations of troops and supplies north of the Yalu River, and was sacked for it. The generals - MacArthur excepted - always know when to stop, salute and figure out another route to what they want. Sometimes they depend on old friends and colleagues safely in retirement to continue to make their arguments. President Obama is nobody's idea of a soldier or strategist, and suspicion grows nearly everywhere that he's in water far over his head and has no idea of how to dog-paddle out of danger. Everything he touches turns to mud - Syria, Benghazi, Libya and now the Islamic State, or ISIS as most people call it. The generals, taught by law, tradition and instinct to hold their tongues, nevertheless see another train wreck coming and are making noises, carefully. "As your commander in chief," he said, "I will not commit you and the rest of our armed forces to fighting another ground war in Iraq." This was too much for Gen. Martin Dempsey, the chairman of the Joint Chiefs of Staff, who told Congress that he would recommend using "special ops" troops to co-ordinate close support for Iraqi soldiers "if needed." The White House, confused and trying to sound heroic, said the general was only speaking of "hypothetical" situations. Well, of course. Everything in the future is "hypothetical." Gen. Dempsey, the good soldier, has to be careful saying what he thinks, but James Conway, the former commandant of the Marine Corps now retired, is free to tell it like it is. Without sufficient troops - "boots on the ground" - to make his strategy work, the president and strategy "don't have a snowball's chance in hell." 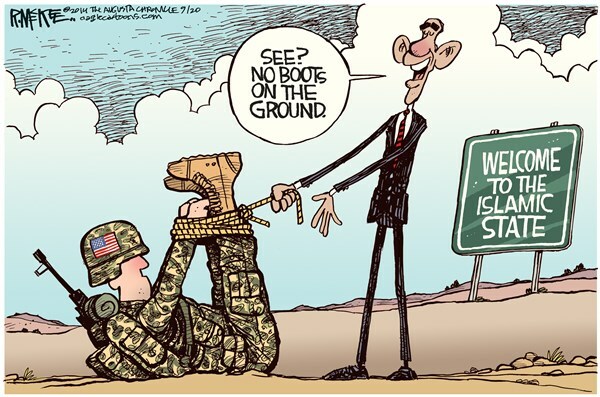 Mr. Obama thinks he can pull success from the air and with "boots on the ground" borrowed from allies. Robert Gates, the former secretary of Defense, says that won't work, and Leon Panetta, another former Defense secretary, told CBS News that the president waited too long to act, anyway. What everybody knows and nobody wants to say, is that the "allies" are not worth much. They don't want to do much, either. They're big talkers but shadow fighters. Global Firepower, a military website that uses 50 factors to rank the military strength of 106 nations, excluding nuclear weapons. The highest-ranking military in the Gulf is Saudia Arabia at No. 25. The Saudis, who spend billions on military stuff they display as expensive toys, are big customers of American and European arms merchants and rarely answer the telephone when Washington calls for help. Only three other nations spend more on arms, but their air force pilots have little combat experience and don't want more. They only want to fly reconnaissance missions when nobody's there to shoot back. Nevertheless, the Obama White House is trying to sweet-talk the Arabs into joining the war on ISIS, even if it's a cameo role. It's all about "optics." The "optics" can tell a lot. The most memorable "optics" of the famous Six-Day War, when it took the Israelis all of six days to defeat the Arab legion, were the photographs of boots left in the desert by Arab soldiers fleeing Israeli tanks. This will be an American show. There's no one else to challenge ISIS. "If it's important enough to fight," said Rep. Jack Kingston of Georgia, a Republican, in the debate last week, "it's important enough to win." This is logic this White House does not understand.